There’s been a lot of buzz recently about a new device that can provide thrust to an object without a corresponding counter-thrust. If true, this would violate a fundamental tenet of physics known as conservation of momentum. Claims of this kind of thing show up all the time “because of the tremendous possibilities if they succeed.” They never work, but in this case there are experiments that claim measurable results. Experiments that have been repeated by multiple teams. Does that mean this effect is real? No.One of the things I’ve emphasized in my posts is the idea that experimental evidence wins in the end. You can have the most beautiful theory in the world, but if experimental or observational evidence clearly contradicts it, then the theory fails. Similarly, if you have an experimental result that is repeatable, even with no theoretical explanation, then that’s valid too. Of course there is another principle I’ve emphasized as well: extraordinary claims require extraordinary evidence. In other words, if you have an effect that seems to violate a physical principle that has been verified for centuries, then you better make absolutely sure your effect isn’t due to some known physics. There are actually two devices that claim this effect. 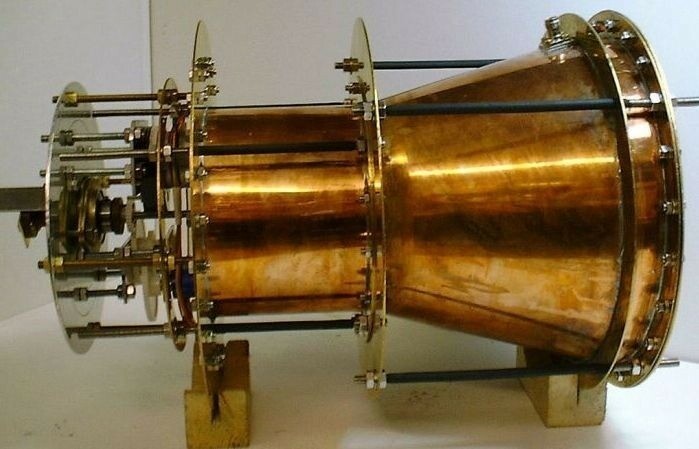 One is known as the EmDrive, developed by Roger J. Shawyer, and the other is the Cannae Drive, developed Guido Fetta. Both of these devices bounce radio waves inside a resonant chamber to create a reactionless drive. The effect observed by these devices are very small, roughly equivalent to the weight of a penny. The problem is an effect on this scale could easily be due to experimental error. For example, uneven heating across the device could cause the air around it to recoil with different energies, causing a net thrust. We see a similar effect with a Crookes radiometer. Of course you could test the devices in a vacuum, but they haven’t done that. So obvious sources of error haven’t been eliminated. There’s another reason to be skeptical as well. When the effect was first shown in 2001 with the EmDrive, the level was just at the limit of sensitivity. When a Chinese team repeated the experiment, they found the effect near the limit of sensitivity. When NASA studied the effect with even more sensitivity, they found an even smaller result. In other words, the more sensitive the experiment, the more the effect goes away. This is a clear indication of experimental uncertainty rather than a real effect. In short, these devices are nonsense. If you are interested in a more detailed smackdown of these devices, I highly recommend you check out John Baez’s posts on the topic, (Part 1, Part 2) where he outlines things in clear detail. its field displacement… concentrated power manipulating a field, which unbalances the environment and causes “thrust” we have only now been able to measure it. This goes hand and hand with a reverse gravity proposal that states gravity is the felt effect of a field displaced by matter creating a “high pressure” boundary. We seriously need to start understanding dark energy. all the answers are there.